We are the group of developers behind various Android app dealing with TeX/LaTeX such as our user-friendly TeX/LaTeX compiler TeXPortal and our modern LaTeX editor TeXpert. This is our main support page where you will find lots of information relating to our distributed software. For your enquiries and feedback, please send email to lameandroidhero at Google mail. We prefer having the name of the app and the nature of your enquiry to email subject. Please note that we do not provide refund at personal request unless for specified reasons. Google Play gives a 15 minute grace period to test your purchased app. If you are not happy with the purchased application, please get the refund within this period via Google Play by yourself. Under no circumstance will our app collect your personal data, save it to our server or publish for third-party. Even so, bear in mind that we do use third-party advertisement API (Google's admob for particular example) and we do not know its working under the hood. Neither are we aware of Android's internal working so we cannot guarantee that your data is never collected or misused by third-party such as Google or your device manufacturer. TeXPortal is an application to typeset TeX documents, targeting mainly at academic researchers. 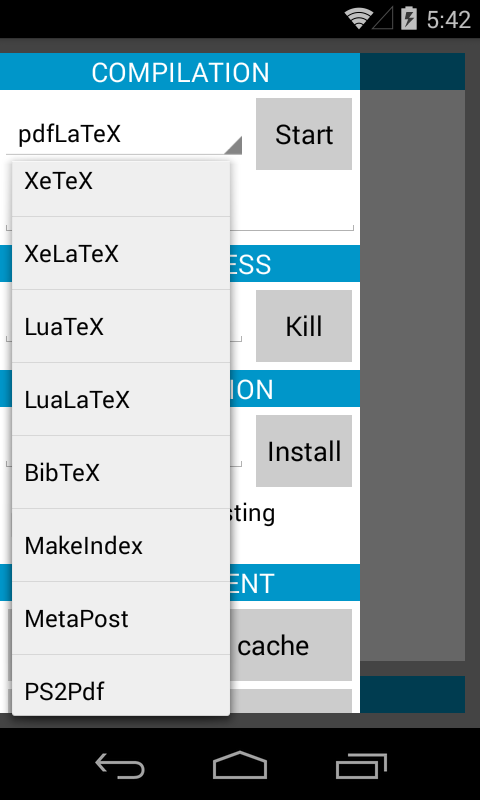 As its primary goal, TeXPortal HELPs compile their TeX documents on Android devices using common TeX engines such as TeX, pdfTeX, XeTeX, LuaTeX i.e. generate DVI, PDF output from the source code. Other useful companion programs commonly used by researcher (BibTeX, MakeIndex, MetaPost) are also provided. Of course, to be useful, a large collection of macro packages as those in Comprehensive TeX Archive Network (CTAN, TeX Live) is also supported. There are available TeX compiling applications in Android market. Unfortunately, they mainly send the document to a remote server to handle the compilation task and then download the result. TeXPortal really works locally (but requires Internet access for downloading additional packages) and this is strongly desirable on mobile devices. It is a huge data bandwidth and waiting time saver in mobile devices where network access (usually wireless) is costly (3G/4G data plan) and much slower than wired access on PC. Local compilation also forstalls security issue of having to send document to unverified server. This also means TeX is always available, even if you are on a plane to your conference where no network access is available. A secondary goal is to make TeX more amicable to users . To do that, we improvise a feature to resolve errors automatically by installing the right missing packages using hints in the generated log. This has an advantage of being much simpler (and hopefully more efficient) than MiKTeX, which probably performs lots of intercepts in TeX. Beyond that, a noteworthy advantage of TeXPortal is its minimalistic approach. That is to say, it acquires only necessary packages . Major TeX distributions in PC install most TeX engines and accompanying utilities available. Because of that, they gorge lots of storage space. MiKTeX, for instance, consumes 300MB in its basic scheme; a similar amount is applicable to TeXLive. This is a huge space wastage since many users do not touch most distributed programs. A basic TeXPortal installation requires 2MB (for pdfTeX only) and 40MB for basic LaTeX packages (half of that if download packages are deleted), a saving factor of 5, extremely useful in limited storage mobile devices. Last but not least, TeXPortal does not require rooting the device, unlike various dangerous methods available such as installing and utilizing a full Linux distributions via chroot . The advantage (of such approach) might be the availability of all TeX utilities at the expense of technical competence requirement from user's side. All operations are available in actions panel which is embedded in the UI on the left side (for large screen) or can be drawn out by dragging finger from the left edge of the screen. Compilation and package installation should be trivial. 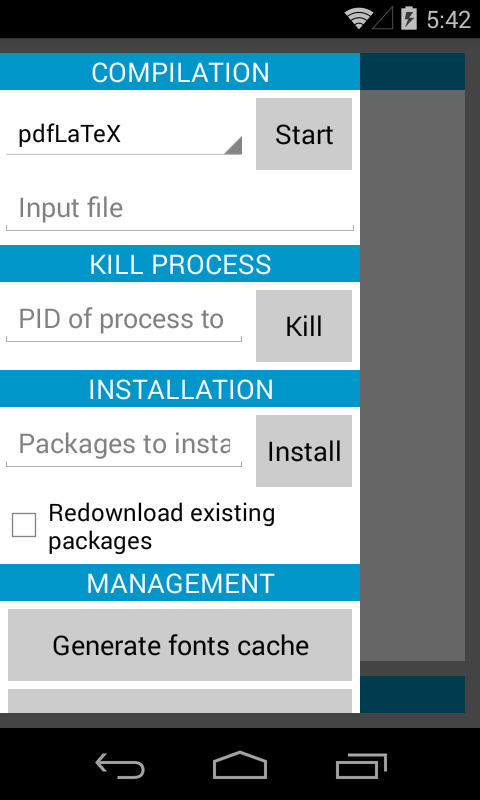 This is some solution where one wants to forcibly kill a process started by TeXPortal such as compiling infinitely loop documents. As the last resort, TeXPortal allows user to kill a process it spawned. To do that, one needs to pick up process ID using some terminal emulator app. Generation of font configuration is necessary if one intends to use XeTeX. Do it after font installation. The settings panel can be drawn from the right edge. Current version allows one to change location to obtain packages: either from the developer's public Dropbox folder (recommended), one of TeX Live online archive or a local folder. Another option is the location to put TeX packages, indicated as TeXMF Root . The default location is TeXPortal's public folder which will be deleted after TeXPortal is uninstalled. The last option is for supported languages to use with package babel . US English is always enabled by default. Under TEXMF root folder (c.f. above section), you might find several folders whose name starts with texmf such as texmf, texmf-dist, texmf-var. Let TEXMF refers to any of them. 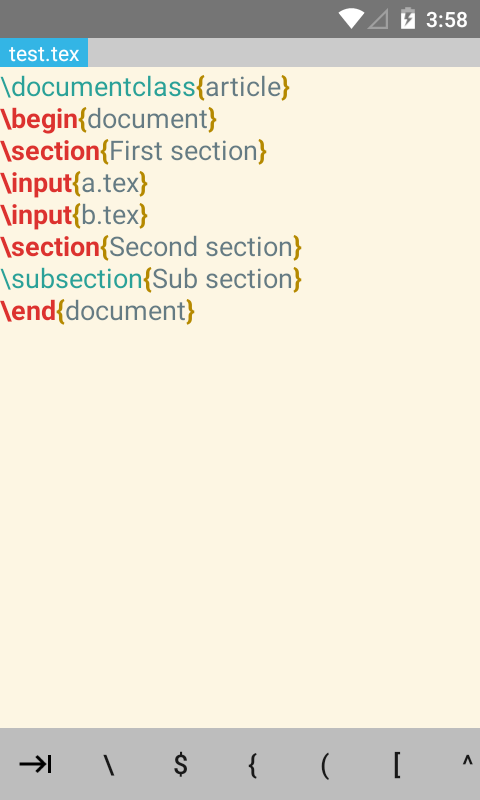 LaTeX styles files (*.sty) should be placed in TEXMF/tex/latex/*/ where * can be any folder. 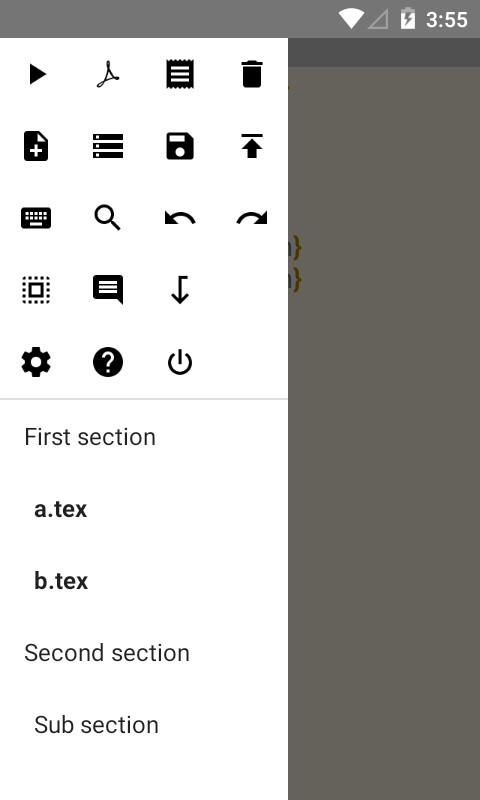 For example, you can make a folder personal in TEXMF/tex/latex/ and then places all your personal styles there. Many LaTeX packages such as shortlst or undertilde are distributed in source form ( *.dtx files , *.ins files). These packages usually need to be compiled into *.sty to be usable. In those cases, please consult their manuals for installation instructions. A good reference is this entry in LaTeX wikibook. Note: After copying files into anywhere under TEXMF , one needs to update path databases. In TeXPortal, this is achieved by installing an empty list of package. This is a hard task which depends on the engine and we totally discourage users from installing custom fonts. Anyway, a good reference is again an article from LaTeX wikibook. (i) Produce the font files (if necessary) and copy relevant files to correct locations (followed by path database update): font-related files (vf, afm, tfm, type1) should go to somewhere within TEXMF/fonts/ while *.sty, *.fd should go to TEXMF/tex/latex/*/ as above. (ii) For fonts to be used in pdfTeX, one needs to add correct entries to font map file TEXMF/fonts/map/pdftex/updmap/pdftex.map . (TeXPortal provides a button to open this file in external editor.) Typically, font packages provide a *.map which should simply be appended to pdftex.map . Our advice is that one should switch to modern engines like LuaTeX which simplifies much of font handling and automatically generates the necessary configurations at runtime. Is TeXPortal open-source? How do I develop app based on TeXPortal? No. It used to be. Please consult our developer guide if you wish to develop applications that make advantage of TeX. Note that TeXPortal uses the *TeX engines as command line programs from TeX Live project whose source code is available at TeX Live. You can grab a copy from our website as well. We compile the engines for Android with the help of the Android NDK released by Google. There is no linkage [in DLL/LIB/SO-sense of the word] between TeXPortal and the engines. What is the difference between free version and paid version? The paid version supports many features such as other engines (bibtex, luatex, metapost, ps2pdf), custom package installation, customize location of packages, customize babel languages, and kill a spawn process. The free version source code lags roughly 300-500 revisions behind the paid one. Why can't I compile in background with TeXPortal Free? Why is TeXPortal Free generally slower than paid version? The free version provides advertisement feature and thus, suffers a bit in term of performance; for example, it has to perform garbage collection more frequently than paid version. As mentioned, free version's source code lags and is not enhanced anymore so it generally lacks a lot of bug fixes discovered in the development of the paid one. This is also the reason most features are stripped off. What are the requested permissions for? We require INTERNET and ACCESS_NETWORK_STATE to download additional packages and WRITE_EXTERNAL_STORAGE to write compilation outputs (PDF file, log, whatever) to sdcard. The free version in addition requires READ_PHONE_STATE, ACCESS_WIFI_STATE and ACCESS_COARSE_LOCATION to track app usage and provide targeted advertisements. Shouldn't TeXPortal and TeXpert be a single app instead of two? He did not intend to write TeXpert at all as he believed that there was a lot of good editors in the market already so he provided the facility for those editors to make use of TeXPortal as in described in our developer guide . Sadly, nobody was interested. Developing TeXpert as a separate app utilizing the specified developer guide is a way to illustrate and test that such idea works. Two separating apps facilitate development processes. It is much faster to build and test each app individually. Unlike desktop software, there is no libraries linking (e.g. DLL for Windows) mechanism on Android. RAM limit of earlier Android OS. In early days, Android apps are limited to 32MB heap memory. By separating into two apps, we can utilize 64MB. And TeXpert is memory consuming. UNIX Philosophy: do one thing and do it best. TeXPortal can be invoked by external app to compile documents. This comes in handy if you want to make use of TeXPortal, for instance, in your TeX editing app. The following code snipet, which should be put in your activity, is to display a dialog to compile a file. For security reason, TeXPortal needs user consent to do compilation. Then, override method onActivityResult of your activity to get information returned by TeXPortal about user action. 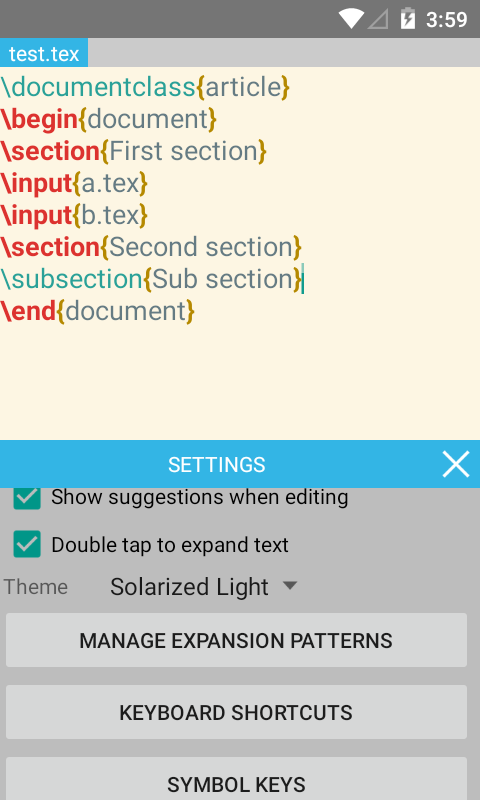 TeXpert is LaTeX integrated writing app for Android. As an integrated environment, TeXpert allows users to execute writing cycles (edit, compile (generate PDF output) via TeXPortal and view the result). As a result, it provides the convenience and productivity because it eliminates the hassles of switching back and forth between different applications. Meaning: one does not have to open, say TeXPortal, to (re)compile the document and wait for it to complete then open generated PDF with another app; finally using Android's Recent apps button or re-open the editing app to go back to continue editing the file. The user interface is designed with usability optimization purpose. For instance, scrollbar is added for fast scrolling through the document. TeXpert provides an embedded PDF viewer that can be displayed along side with the document. Remark: TeXPortal is required to compile documents. TeXpert provides fast syntax highlighting with little lagging. Noteworthy capability is mathematical formula highlighting , a feature rarely provided by editors. Even on PC, only TeX Maker seems to provide that capability. 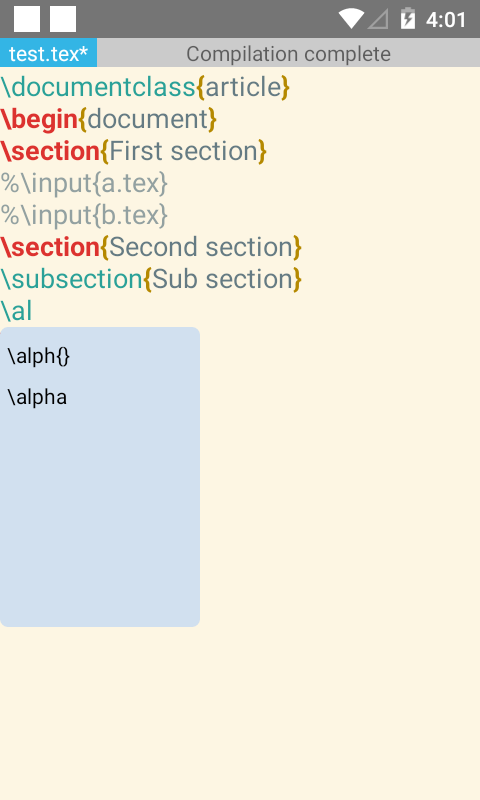 Beyond that, TeXpert understands LaTeX unlike general purpose text editors. It offers easy access to frequently used symbols in LaTeX documents such as dollar and backslash, hierarchical document outline (i.e. \chapter , \section , \subsection , etc. ; Version 2.3.2 goes a step further by considering beamer frame 's. ), annotated log, etc. These features facilitate much better navigation because writer usually works on organizational units and also help in debugging process. TeXpert also provides smart code completion. Further than being an editor, TeXpert simplifies lots of mundane storage operations such as downloading, editing and then uploading files back to cloud storage such as Dropbox. Not only that, from version 2.3.2, it hints user and acquires necessary resources for compilation, namely images in \includegraphics command or additional source in \input command and even bibliographic database. How inconvenience it is having to download all those files individually! Most actions should be explanatory. We have some remark on some of them. Document outline: click on item to jump to the code declaring that item; in case it is a referenced resource such as \input, long click on the item to open the resource file. The PDF viewer included in TeXpert provides SyncTeX technology to jump back to the position in the source document that generates the particular content in PDF file. To do that, long tap at a position in PDF file. For this to work, make sure to open your document under /storage/emulated/0/ in the file explorer. The symbolic link /sdcard in Android actually points to /storage/emulated/legacy/. TeXpert provides two mechanisms to assist you in your writing. Popup suggestion: Pop up the command matches your partially typed command, tap on the item from the pop up list to insert it to the document. Note: One must check the option in Settings to enable this feature. Expansion via patterns: Press the button in the app's extra keyboard or Tab to expand the token at the cursor based on your defined expansion pattern. This feature is borrowed from TeXworks. Open Settings from action panel, click on Manage expansion pattern and then Add expansion pattern to open dialog to add patterns. See this document for more details. Note that unlike TeXworks, we do not support bullet character. But you can add an #INS# in its place and use Ctrl+I to cycle through the #INS# and replace them. For your convenience, we list the keybinding here as well. Many combinations such as `Ctrl+C` and `Ctrl+Z` should be standard to remember. Ctrl+T or F1 Compile main document using the primary engine (pdfLaTeX by default, change in Settings). Ctrl+P View PDF: either split the screen to show the editor and PDF side-by-side or show PDF in fullscreen. Then jump to the PDF position corresponding to the code location at the editor's cursor. All screenshots here are for tablets. Phone is not officially supported although TeXpert also works well on them. Also, these screenshots are captured for full version. As a result, some are not applicable to Lite version. Rudimentary SyncTeX support - Require latest version of TeXPortal [Full/Free] - Jump from PDF->Source: long tap or double tap on PDF document - Jump from Source->PDF: Ctrl+J or Edit (pencil icon) > Jump to PDF in toolbar - Note: SyncTeX can only jump to the "correct" line so break lines frequently - Usage note: For this to work, make sure to open your document under /storage/emulated/0/. The symbolic link /sdcard in Android actually points to /storage/emulated/legacy/. Fix crash when \input-ed document has no \section, \subsection, etc. Update Dropbox's app publisher. Please re-authenticate to grant the app access to your Dropbox. Update Google Drive's app account as well. 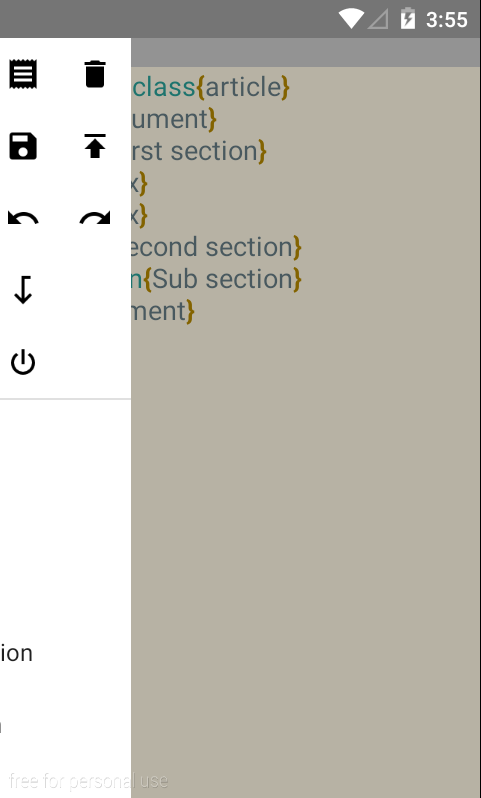 Auto-hide scrollbar: Tap on the area near right edge to expose scrollbar for interaction; scrollbars are automatically hidden if inactive for a few second. Also restore scrollbar for editor. 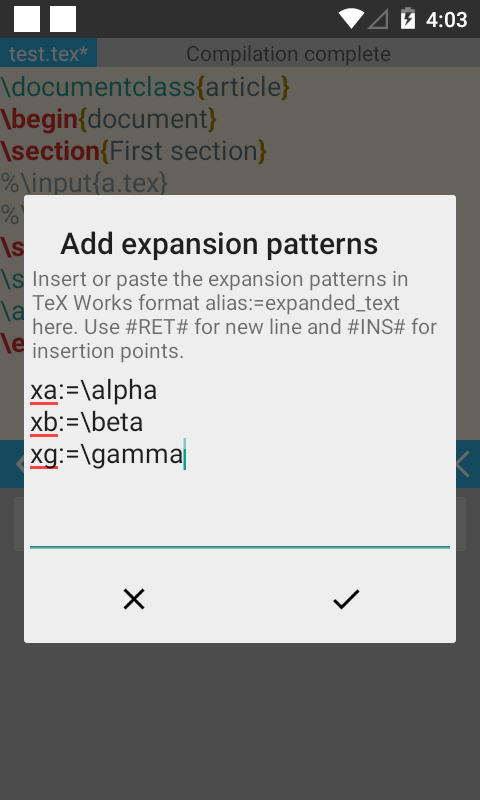 Support multiple #INS# in expansion patterns: use Alt+Tab to go to next insertion point. Bind key F1 to compile with primary engine (pdfLaTeX) and F2 to compile with secondary engine (BibTeX). Fix bug: editor and PDF settings not being applied on start-up. Fix bug: missing meta-data for google play service version. Major UI revamp: Remove swiping from edges gesture to pull out the document outline panel, click on file name to do that. Also Setting panel, like document outline, is shown as pop up panel. Keyboard shortcut dialogs & manage patterns dialog are now part of the Settings pop-up. Add alternative toolbar tailored to larger tablet screen (e.g. Nexus 7). Remove ( ) + = symbol keys on small screen. Hopefully, this might fix overlaid [Maximize] button on Samsung devices. Support TeXWorks code completion (press Tab to expand word at cursor using pre-defined patterns). Add completion patterns from Settings panel. Note that bullet is not supported. Add debugging option to save log file at /sdcard/texpert.log. Currently only log storage and I/O operations. Simplistic code completion; enable in settings. Ergonomic feature: periodic rest reminder. Note: On Lite version, it will attempt to load and show a fullscreen advertisement every 5 minutes. If advertisement cannot be loaded, a 1-minute break is compulsory. If the advertisement can be successfully shown, user can dismiss it [by pressing Back button] to continue editing. Add option to periodically save latest document content to a backup file. Backup file name is the original file appended with tilde ~ character. Remark: This is a bit unconventional back-up method. Usually, editors simply save the changes to original file and make a copy of the original file. Also, add button to upload the compiled PDF to cloud storage. NB: This is applicable to cloud files only i.e. those open directly from Dropbox or Google Drive. The PDF file will be uploaded to the same folder as the source. 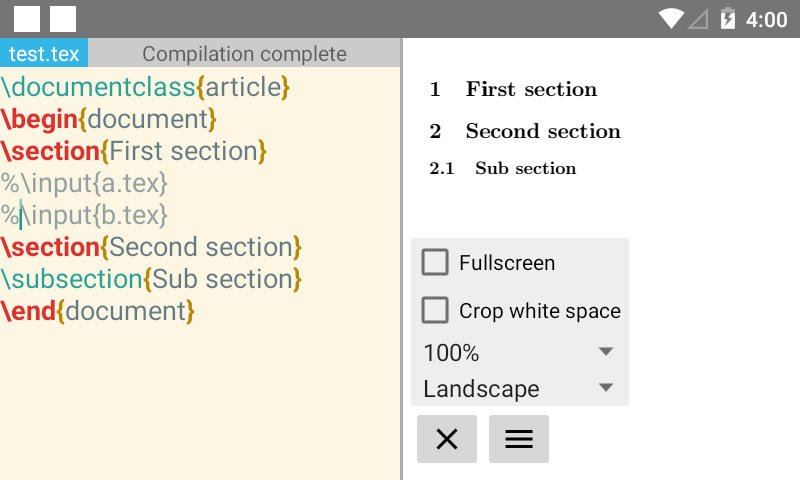 Fix and enhance the resource navigator: Handle recursive \input tree; Expand item on click; Do not download resource if it already exists; Prevent edit loss due to reload; Nicer view with connecting lines. Warning: App might crash in case of circular inclusion! Multi-window support. NB: This feature is only applicable to several Samsung devices. IMPORTANT: Compilation requires TeXPortal 2.3.5.7.11.13 due to changes in TeXPortal service structure. IMPORTANT: After logging in Drive or Dropbox, the file browser might spin forever. In such case, click on the corresponding Drive/Dropbox button. Show dialog to prompt user about acquisition of additional resources (TeX files in \input or \include , images in \includegraphics and bibliography database in \bibliography ) before compilation. Note that recursive inclusion ( \input within included files) is not yet supported! Document outline now takes beamer frame into account. User interface is revamped and redesigned. Secondary toolbar is removed and replaced by ephemeral modification of the main toolbar. Actions are reorganized: frequent actions (save, compile, view pdf) are put in main toolbar while infrequent ones (open, bibtex, settings, etc.) are accessed via "three dots" buttons. Settings is also integrated into main UI so that user can see instant effect on the editor. Dialogs share common/unified style with ok/cancel-icons buttons. Text color theme for syntax highlighting is revised to work well for dark background. There is also a top status bar showing status of background operations. Show message when there is no accessible Google account. For e.g. the list of accounts is shielded by privacy apps. The file browser will now open last visited folders and also select last selected files. We no longer support Box due to high maintenance cost. PDF rendering is now performed via external processes and pipes to prevent crashing due to native code in JNI. This is also to conform with MuPDF's AGPL licensing and potentially allow Lite version to display PDF. See LAHpdf. Add background service to keep app process alive when there is unsaved modifications: to prevent app being killed (hence, changes are lost). Notification is shown if one closes app with modified document. Fix many other miscellaneous stuffs such as eliminating all Parcellable-related stuffs (hopefully fix crashes on incompatible rooted devices); "zoomed" PDF scrolling i.e. page shift amount is different from actual finger movement distance; auto-save-before-compile feature for remote documents. LAHpdf is an interactive program to get information about PDF document and render PDF pages to PNG images. LAHpdf is used in TeXpert to render PDF document for two important reasons. First, it is executed in separate process and thus, if it crashes, TeXpert does not crash. Second, it allows TeXpert to have its source code private because there is no linking: there is thus no violation of MuPDF AGPL v3.0 license as long as LAHpdf is open source and licensed under the same AGPL v3.0. 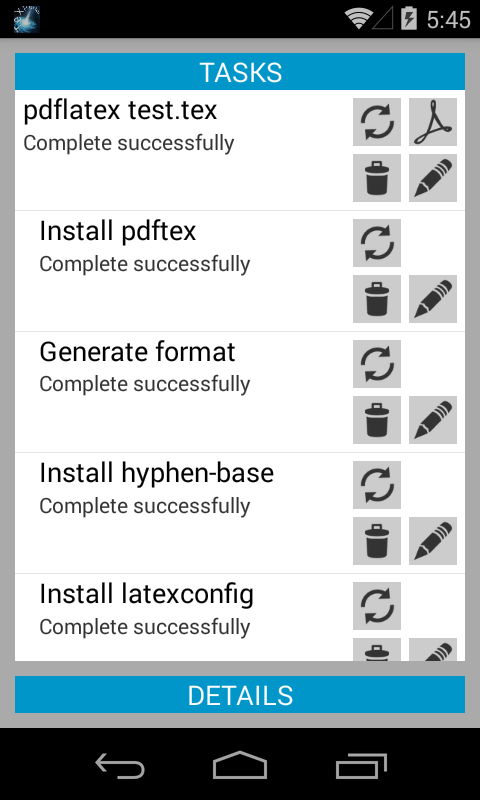 Remark: On Android 5.0 Lollipop, we use Android PDFRenderer API to render PDF. %d %f %d %d %d %d : render a rectangular region of a page. For this rendering command, the first number is the index of the page to render (count from 0), the second is the zoom factor, the remaining are for coordinates of left-top corner followed by the width and height of the target region. The bitmap (in PNG format) is dumped to standard output stream. The source code is included below and is licensed under GNU Affero Public License (AGPL) v3.0 . For compilation instructions, please consult MuPDF documentation. /* Copyright © by L.A.H.